Since time immemorial, the hero's journey has been taken by wizards, goddesses, sages, and ordinary people, and whether you realize or not, you are taking it right now. You have been called from your everyday world, to quest for change, for knowledge, for peace, for strength. You may have already crossed the threshold, discovered treasure, or be on the way home, changed, empowered and ready to share your wisdom. Wherever you are in your journey, the 52 cards of this unique deck are your willing, supportive and trustworthy companions. Discover the wonder of the archetypal journey through the Fusion art of Rassouli and the clear guidance of bestselling author Kelly Sullivan Walden. Together, they have created a breathtaking portal into self-understanding with direction on how to be the courageous, inspiring and natural hero of your story. 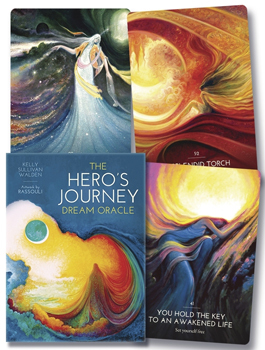 Awaken the hero within, unlock the hidden insights of your dreams, and navigate every stage of your quest, with The Hero's Journey Dream Oracle. 52 cards and 152-page guidebook set, packaged in a hardcover box.